The European Rugby Champions Cup is an annual rugby union tournament organised by European Professional Club Rugby (EPCR). It is the top-tier competition for clubs whose countries’ national teams compete in the Six Nations Championship. Clubs qualify for the Champions Cup via their final positions in their respective national/regional leagues (Premiership, Top 14, and Pro14); those who do not qualify are instead eligible to compete in the second-tier Challenge Cup. Introduced in 2014, the competition replaced the Heineken Cup, which had run since 1995, following disagreements between its shareholders over the structure and governance of the competition. Saracens are the current holders of the cup, having won their first cup by beating Racing 92 in the 2016 final and defended their title by beating Clermont in the 2017 final. Toulouse have won the competition a record four times, the last of which was in 2010. 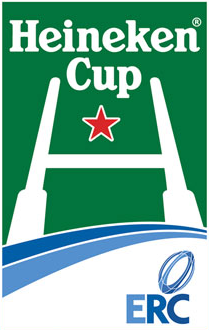 The Heineken Cup was launched in the summer of 1995 on the initiative of the then Five Nations Committee to provide a new level of professional cross border competition. Twelve sides representing Ireland, Wales, Italy, Romania and France competed in four pools of three with the group winners going directly into the semi-finals.English and Scottish teams did not take part in the inaugural competition. From an inauspicious beginning in Romania, where Toulouse defeated Farul Constanţa 54–10 in front of a small crowd, the competition gathered momentum and crowds grew. Toulouse went on to become the first European cup winners, eventually beating Cardiff in extra time in front of a crowd of 21,800 at Cardiff Arms Park. Without English clubs, the 1998–99 tournament revolved around France, Italy and the Celtic nations. Sixteen teams took part in four pools of four. French clubs filled the top positions in three of the groups and for the fourth consecutive year a French club, in the shape of Colomiers from the Toulouse suburbs, reached the final. Despite this it was to be Ulster’s year as they beat Toulouse (twice) and reigning French champions Stade Français on their way to the final at Lansdowne Road, Dublin. Ulster then carried home the trophy after a 21–6 win over Colomiers in front of a capacity 49,000 crowd. English clubs returned in 1999–00. The pool stages were spread over three months to allow the competition to develop alongside the nations’ own domestic competitions, and the knockout stages were scheduled to take the tournament into the early spring. For the first time clubs from four different nations – England, Ireland, France and Wales – made it through to the semi-finals. Munster’s defeat of Toulouse in Bordeaux ended France’s record of having contested every final and Northampton Saints’ victory over Llanelli made them the third English club to make it to the final. The competition was decided with a final between Munster and Northampton, with Northampton coming out on top by a single point to claim their first major honour. In 2003–04 the Welsh Rugby Union (WRU) voted to create regions to play in the Celtic League and represent Wales in European competition. Henceforth, Wales entered regional sides rather than the club sides that had previously competed. English side London Waspshad earned their first final appearance by beating Munster 37–32 in a Dublin semi-final while Toulouse triumphed 19–11 in an all-French contest with Biarritz in a packed Chaban Delmas, Bordeaux. The 2004 final saw Wasps defeat defending champions Toulouse 27–20 at Twickenham to win the Heineken Cup for the first time. The match was widely hailed as one of the best finals. With extra time looming at 20–20, a late opportunist try by scrum half Rob Howley settled the contest. The tenth Heineken Cup final saw the inaugural champions Toulouse battle with rising stars Stade Français when Murrayfield was the first Scottish venue to host the final. Fabien Galthié’s Paris side led until two minutes from the end of normal time before Frédéric Michalak levelled the contest for Toulouse with his first penalty strike. He repeated this in the initial stages of extra time and then sealed his side’s success with a superb opportunist drop-goal. Toulouse became the first team to win three Heineken Cup titles. The 2006–07 Heineken Cup would be distributed to over 100 countries following Pitch International’s securing of the rights. That season was the first time in the history of the competition that two teams went unbeaten in pool play, with both Llanelli Scarlets and Biarritz doing so. Biarritz went into their final match at Northampton Saints with a chance to become the first team ever to score bonus-point wins in all their pool matches, but were only able to score two of the four tries needed. Leicester defeated Llanelli Scarlets to move into the final at Twickenham, with the possibility of winning a Treble of championships on the cards, having already won the EDF Energy Cup and the Guinness Premiership. However, Wasps won the final 25 points to 9 in front of a tournament record 81,076 fans. During competition there was uncertainty over the future of the tournament after the 2006–07 season as French clubs had announced that they would not take part because of fixture congestion following the Rugby World Cup and an ongoing dispute between English clubs and the RFU. The 16th Heineken Cup tournament in 2011 resulted in an Irish province lifting the title for the fourth time in six years as Leinster recorded their second triumph in the competition. They defeated former multiple Heineken Cup winners Leicester and Toulouse in the quarter and semi finals. At the Millennium Stadium in Cardiff, in front of 72,000 spectators, Leinster fought back from a 22–6 half-time deficit in the final against Northampton Saints, scoring 27 unanswered points in 26 second-half minutes, winning 33–22 in one of the tournament’s greatest comebacks. Jonathan Sexton won the man-of-the-match award, having scored 28 of Leinster’s points total, which included two tries, three conversions, and four penalties. Leinster successfully defended their crown in 2012 at Twickenham, eclipsing fellow Irish province and former champions Ulster 42–14 to establish the highest Heineken Cup final winning margin. The performance broke a number of Heineken Cup Final records. Leinster became only the second team to win back-to-back titles, and the only team ever to win three championships in four years. In addition, the game had the highest attendance at a final (81,774), the highest number of tries (5) and points (42) scored by one team and the highest points difference (28). Following the November 2015 Paris attacks, all round-one games due to take place in France that weekend were called off, along with the round-two fixture between Stade Français and Munster. Rescheduling of some matches was difficult, partly caused by fixture congestion due to the 2015 Rugby World Cup.